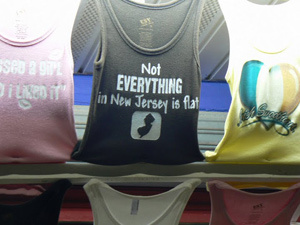 People who live in New Jersey have a special way of referring to the beach. It’s not called the beach; it’s The Shore, and when you visit here, it’s called going "down the shore." jokes and the stereotypes that mar my home state’s reputation. Seven seasons of the wildly popular Sopranos didn’t help either. Island is a narrow strip with a shallow bay on one side, (favored by crabbers) and the crashing Atlantic on the other. Twilight down the shore is a feeling, and an experience that’s been a part of my family’s life for three generations. It begins at the end of a long day at the beach, where lots of swimming and sun has left you sun bleached and tanned. It transitions with an outdoor shower and a change of clothes that feel smooth on your body and a relief from your wet bathing suit. 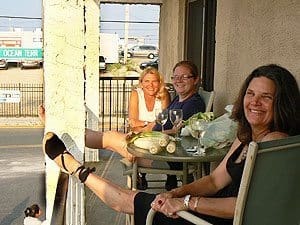 It culminates as one enters the porch or the deck, surrounded by friends and family with a cocktail and a sense that all is well with the world. 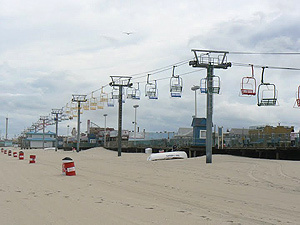 Chairlift at Seaside Heights, above the boardwalk. Anticipation of a seafood dinner only adds to the satisfaction. We were searching for the Twilight down the shore during this vacation. Aggie Roberts is the Music Man of the Jersey Shore. His ice cream shop on Grand Central Avenue in Lavallette packs them in seven days a week. 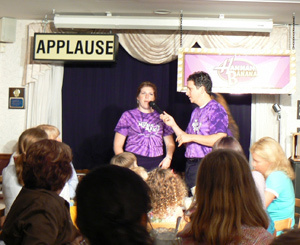 While serving ice cream treats, a troupe of singers dances and clowns with the crowd for an hour of fun. The shows keep Aggie working eighteen hours every day of the short summer season. He’s been at this for seven years. They had 30,000 paying guests the first season, and in 2008 they saw 40,000. The combination of enthusiastic, talented singers and ice cream treats for folks on vacation is a hit! Each year Roberts has more than 125 eager drama majors from colleges up and down the East Coast audition for five coveted spots in his roster. Packed houses enjoy sundaes, ice cream floats and brownies slathered with chocolate sauce along with the rollicking cabaret. Aggie, at right, with one of his singing staff. photo by Max Hartshorne. Earlier in the afternoon, the troupe puts on 4 pm Fairy Tales and they offer 5 pm shows too. Lavallette is a sleepy beach town about three miles north of the much busier, much noisier Seaside Heights. It’s a welcome respite and the beach is free of carnival rides and kitsch. In Lavallette’s public library, the six computers are in use every hour they’re open, but a little secret is that The Music Man offers free Wi-fi and good coffee, starting at 8 am. Aggie said he’s open partly because somebody has to field the hundreds of phone calls they get from people who want to reserve for the singing shows. Funny tee shirt on the boardwalk. In Ortley Beach, which is a tiny speck of a town between Lavallette and Seaside Heights, the Ortley Fish Market is an excellent place to pick up some fresh swordfish or clams. Like most businesses and restaurants on this island, they don’t take credit cards. Something about the fees levied on seasonal businesses. We found a nice little restaurant in Lavallette called the High Tide Grill. They pureed some pineapple for my seven-month-old granddaughter, and their artichoke dip came with a creative twist — thin slices of fried potatoes. It’s only been open a month or so, but the clean exterior, friendly staff and creative menu bode well. The owner’s family has owned the pizza shop and coffee place next door for decades. Next door to the High Tide is a year-round establishment called Salty’s Diner that offers an interesting twist on breakfast... a crab cake Eggs Benedict. The serving is huge, comes with spinach and is definitely enough for two, so ask them to split it. 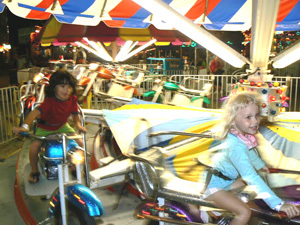 Kids enjoy riding around and around in Casino Pier in Seaside Heights. photos by Max Hartshorne. We also found big fluffy pancakes and eating on the sidewalk while strollers pass by is fun. The Jersey Shore of course has attractions that appeal to various age groups. We found that the Seaside Heights area is best for pre-teens and teens, who love the noise of the arcade, the tacky boardwalk attractions and especially the rides at Casino Pier. 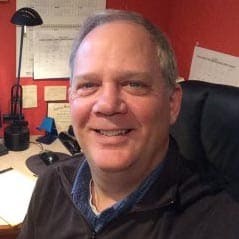 But for families with small children or no children, a better choice would be Lavallette or Ortley Beach, where you can rent small houses within walking distance to the beach. In both towns you can take the littlest ones to the beaches by the Bay, where there are playgrounds and gentle waves. On the ocean side, you’ll watch in horror as your little tykes dance amidst crashing waves with a fierce undertow. The lifeguards spend a whole lot of breath blowing into whistles to keep swimmers on their side and surfers on theirs. Giraffes love to lick cars as they drive through the Wild Safari at Six Flags Great Adventure, Jackson, NJ. It costs $5 for a one-day beach pass, that’s one expense that nearly all Jersey beaches extract from visitors. Parking is another expense that’s relentless in Seaside Heights. Meters are monitored 24 hours a day, (I kept wondering if the meter maids were really patrolling and ticketing at 4 in the morning). The main reason to visit the shore is to spend some quality time on the beach, splash in a pool or in the sea, and find that Twilight down the shore time that’s the essence of family and relaxing times. But in the course of a week, we wanted to find some nearby attractions and one highlight is the Wild Safari at Six Flags, about 40 minutes from Seaside Heights. 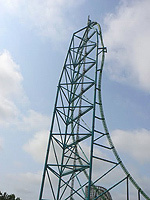 Kinda Ka rises 450' up and takes riders down at 128 mph. Scary! Opened in 1974, the 20-acre park still has many of the original animals in the first herd. Just about every major mammal you’d expect to see in a zoo is here roaming free or behind fences in big enclosures. We saw lazy lions, tigers, strutting ostriches and red-butted baboons, including a tiny baby who was no more than eight inches high! 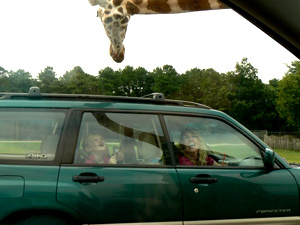 But the highlight were the gregarious giraffes who walked right up to the car and licked the roof and windows. We were admonished not to open the windows, feed the animals or to ever get out of the car. It was fun to watch these gentle giants who have lost any fear of people get so close to us. Wild Safari is part of Six Flags Great Adventure, where the most colossal and scary looking ride is called Kingda Ka, and towers 450 feet above the park. The track for the car goes straight up and after a small loop, straight down, taking its riders a staggering 128 miles per hour. During our visit the giant tower had been struck by lightning, so nobody got to cheat death. But if you’re a roller coast and amusement park ride fan, this one has gotta be on your list. Admission to the park can be expensive, but if you look for coupons and take advantage of their specials, you can get in for about $49. Bring sheets and pillowcases, since most weekly rentals do not include these. We had to go out and buy a few sets at a discount store. Bring cash to Lavallette, since many restaurants don’t take credit cards, and some don’t allow you to add the tip to the credit card charge. Bring basic food supplies so you can save by cooking dinner on your own. A seafood dinner is a whole lot cheaper if you pick up Jersey corn and tomatoes at Jerry’s Farmstand in Ortley Beach. Island Beach State Park is a very large reserve that costs just $6 per car. That’s a lot cheaper than the daily beach badge cost of $5 each, and there is no boardwalk full of carnival rides, cotton candy and pizza shops. Of course some people may like that, but if it’s nature you’re after, head down to the end of the island to the state park.